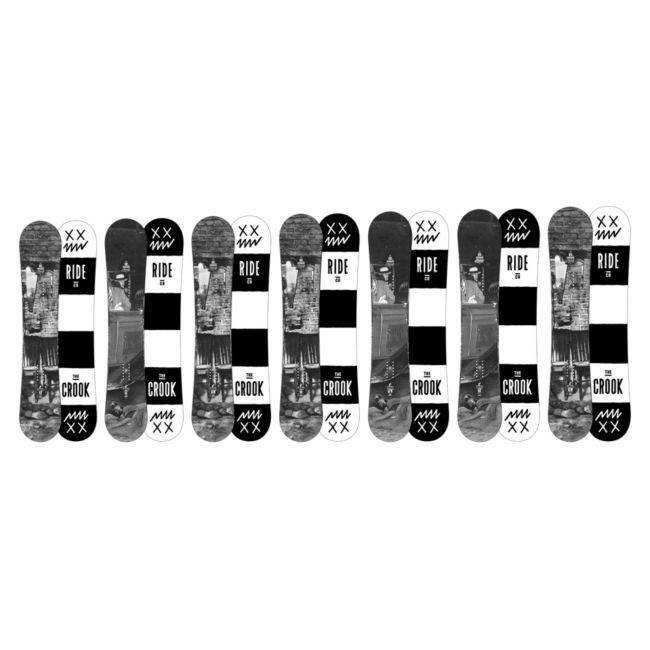 The Ride Crook is a really fun well balanced freestyle board that is very snappy poppy and playful but still offers stability between the feet. It didn’t have that Ride Ultra damp feeling which made it feel a little more lively underfoot for a freestyle to jib board. It’s been a low cost favorite in the past and it’s very close to how the Ride Kink Rides. Not much changed from 2014 to 2017. There seem to be a few tweaks but overall it feels pretty much the same as it use to when we first tried it. It’s still a very fun entry level jib to freestyle board. Conditions: Soft Snow one day and primarily hard snow with some softer snow the next. 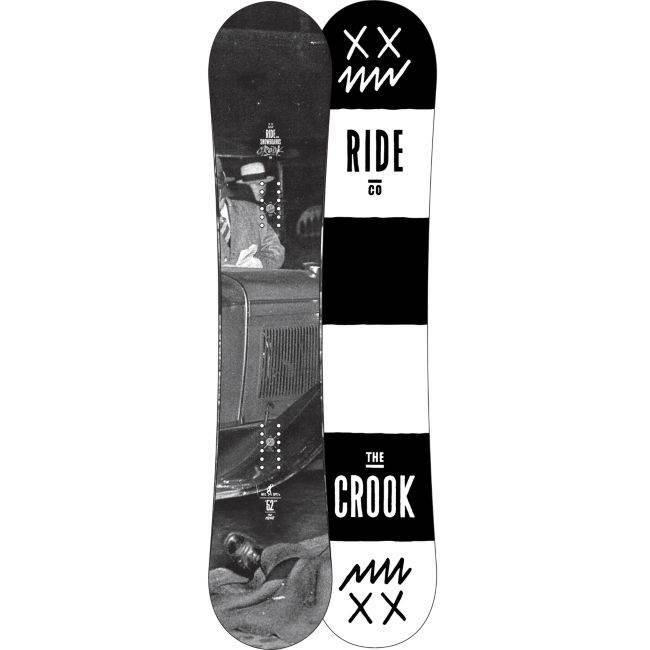 On Snow Feel: Very stable between the feet because of the flat to rocker profile between the feet. 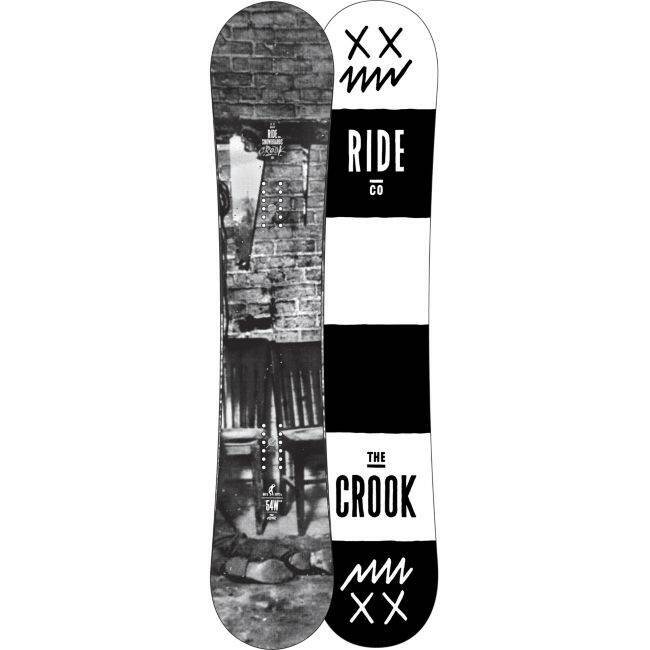 It makes it very easy for beginner freestyle to all mountain freestyle riders to get off the chair or deal with long flat runs that can be awkward when you have rocker between the feet. It’s got a stable but very catch free confidence inspiring ride for riders of almost any level. It works for an expert park rider on a budget and a beginner rider that wants to progress without having to buy a new board. It’s got a light snappier feel to it. Powder: We did not get any powder but we have ridden other ride twins with flat to rocker and this should be pretty good for taking a freestyle approach to the fluffy stuff. It should be really fun if the powder is light and fluffy but will be a little more work if you encounter thick deep powder like you find near the West Coast. Turn Initiation and Carving: Pretty easy edge to edge for a rider that skids their turns and not bad for a rider that actually likes to rail a turn as well. It’s quick without being twitchy for short radius turns and pretty good for a soft flat-rocker twin when making wide radius turns and doesn’t feel completely lifeless. Its not great on a carve but it doesn’t wash out unless there is a lot of pressure. Speed: This doesn’t have the ultra damp Ride feel and you can feel the board chatter under foot when you pick up speed. It’s fine for most places in the park but on the mountain you can begin to see it’s weaknesses. Uneven Terrain: You can handle a crowded Saturday all day because of it’s soft flex but there is some pass through when it comes to hitting smaller bumps or riding a hard bumpy groomer. Edge Hold: Pretty good here. We had some hard (not icy) snow and the edge held well. Right out of the wrapper this felt pretty good and almost great but over time it’s not going to hold like other boards with a little extra mustard in the side cut. Switch: Like all true twins it’s really easy. Jibbing: Very easy to hit just about any feature in the jib park and it’s a confidence inspiring ride here. Pipe: It wasn’t bad in the pipe for such a soft jib specific board but after a few weeks in the jib park the edge hold will be gone and this won’t feel as good as it did for us. Jumps: It’s not the poppiest thing that we have encountered but there is something about it that makes it really fun to ollie. It’s got an easy snap to it that makes it fun for riders of all levels to generate their own air on. It also has a stable confidence inspiring approach to kickers. 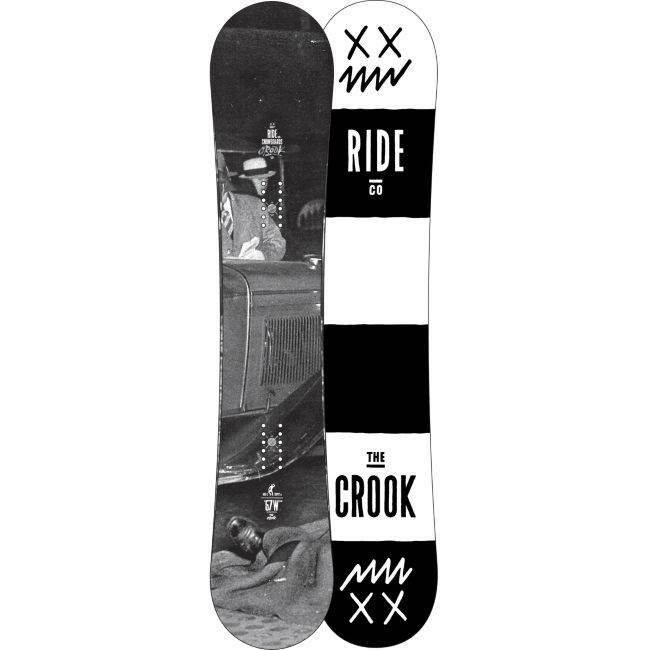 We try to get as many images of the Ride Crook, but forgive us if they're not all there.